Children’s Books We Love! : Chinese Culture | OFF KLTR! Here is a list of some of our family’s favorite story books, which are to varying degrees, based on Chinese culture. Dim Sum for Everyone by Grace Lin. Knopf, 2001. In typical Grace Lin fashion, this book has very little text and gorgeous artwork. The book shows a Chinese-American family enjoying dim sum at a Chinese restaurant. At the end of the book, there is a history of dim sum, most appropriate for grown-ups and older readers. While eating at a Chinese restaurant, a young Chinese American girl opens her fortune that reads, “You see the world in a different way.” We see how her fortune is quite true throughout the rest of the book. Very sweet. Good Morning China by Hu Yong Yi. Roaring Brook Press, 2007. This book is absolutely beautiful. It takes place in a park, early in the morning in China. It shows children playing and grown-ups painting, exercising, and meditating. Each page shows one section of the park and the final page puts all of the previous pages/sections of the park as one complete picture. Kite Flying by Grace Lin. Knopf, 2002. This book is a follow-up to Dim Sum for Everyone! (Knopf, 2001) In this book, the family is making kites. Again, Grace Lin offers much more detailed drawings than text, and as usual she ends the book with a brief history of kite flying. Moonbeams, Dumplings, and Dragon Boats by Nina Simonds, Leslie Swartz, and the Children’s Museum of Boston. A treasury of Chinese holiday tales, activities and recipes. Stories have a lot of text. Activities and recipes are somewhat complicated. Book is most appropriate for older, school-aged children. One is a Drummer by Rosanne Thong. Chronicle Books, 2004. From the same series as Round Is a Mooncake (2000) and Red Is a Dragon (2001, both Chronicle). This book uses counting as a way to introduce Chinese customs and culture. One Year in Beijing by Xiaohong Wang. Chinasprout, 2006. We love this book! It is so nice to have a story about contemporary China and contemporary Chinese culture!! The main character of the book is an eight year old girl who lives in a city with her professional Chinese parents. Red is a Dragon by Rosanne Thong. Chronicle Books, 2001. From the same series as Round Is a Mooncake (2000) and One Is a Drummer (2004, both Chronicle). This book uses colors as a way to introduce Chinese customs and culture. From the same series as One is a Drummer (2004) and Red Is a Dragon (2001, both Chronicle). This book uses shapes as a way to introduce Chinese customs and culture. Ruby’s Wish by Shirin Yim. Chronicle Books, 2002. This is another great book! It’s set in turn-of-the-century China. The main character, Ruby wears (the lucky color) red all the time. Her grandfather is a very rich man with many, many children and grandchildren. In the book, Lucy goes to school with her brothers and sisters and cousins. The other girls stop going to class as they prepare to become wives and mothers, but Ruby continues to study hard. Ruby knows that soon she, too, will be married and have to leave her home. But everything changes when she gets the most wonderful Chinese New Year Gift! 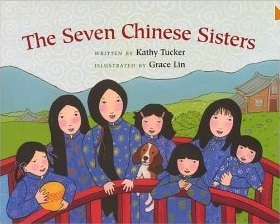 Seven Chinese Sisters by Kathy Tucker. Albert Whitman & Co, 2003. This is a Favorite at our house! Keira has memorized it! Each of the seven Chinese sisters has a different talent (but they don’t know the youngest sister’s talent, “as she’s just a baby!”). One day, a very hungry dragon comes to the sisters’ house and steals the baby! The sisters must use their talents to rescue the baby. And in the end, we discover the youngest sister’s talent. Ugly Vegetables by Grace Lin. Charlesbridge Publishing, 1999. Yet another OFF KLTR favorite! A Chinese-American family grows very ugly vegetables in their garden. The little girl is sad because the garden isn’t beautiful, like all the neighbors’ flower gardens. But in the end, her mother makes the most delicious soup with the ugly vegetables, giving the little girl (and her neighbors!) a new appreciation for the vegetable garden. There are so many great books on the list. As you may gather, Grace Lin is one of our favorite authors. Keira and I have been reading her chapter books at night (The Year of the Dog + The Year of the Rat). They are autobiographical. The reason I point this out is that we found out that she wrote The Ugly Vegetables as a contest entry into an elementary school contest and came in 4th place nationally. This is one of our favorite spring time books. One Year in Bejing does a nice job of explaning the different holidays and seasons. Ruby’s Wish is probably my favorite as this is also a true story.